But the Nyquist transcends these common shortcomings, rendering images as fully fleshed-out three-dimensional objects surrounded by tangible air, much the way that great analog does. This was particularly true when the Nyquist was decoding MQA files; the format preserves these low-level cues and presents them in a completely natural way. The specific quality was appealing not in-and-of-itself, but because of the way it sounds more like real instruments in an acoustic space. The bloom and dimensionality wasn’t just in the mids and treble, but also through the entire bass region. The bass was big, weighty, and full rather than taut and crisp. Pitch definition was excellent, but what really distinguished the bottom end was the sense that acoustic bass had a three-dimensional body and wasn’t a flat cardboard cutout. The stand-up bass on the Rhiannon Giddens track “That Lonesome Road” from the album Factory Girl, which has big and bloomy “washtub” sound that fits the tune, had a stunning sense of body, depth, weight, textural density, and power. The bass overall tended to be warm, rich, and generous—qualities that conveyed the physicality of the instrument. The densely textured bottom end, wonderful sense of three-dimensional bloom, and resolution of fine spatial detail was particularly beautiful on piano. The instrument’s solidity and warmth brought to the fore left-hand piano lines, particularly evident on Brad Mehldau’s unique phrasing and ability to explore a melody with both hands with equal intensity and technical virtuosity. Speaking of piano, once you get used to hearing that instrument reproduced in the MQA format, conventional digital encoding’s distortions become painfully evident. MQA removes the “shattering” sound of hammers hitting strings in the upper register, reveals greater harmonic complexity, presents a larger space around the instrument, and resolves decays (and the way that the harmonic structure changes throughout that decay) down to a lower level. Sound quality with DSD was spectacular—open, airy, and detailed. The track “St. James Infirmary” performed by Alex de Grassi on solo acoustic guitar [Blue Coast Music] was beautifully portrayed. I could hear the finest details in the harmonic structure of the strings and the resonating guitar body. The transient attack was vivid and lifelike without being etched or unnatural. A sense of bloom and air surrounded the instrument, as though we were in the same room. The guitar had vivid tangibility in a totally natural and organic way. There wasn’t a hyped sense of presence or forwardness, just an understated ease that made it easy to forget I was listening to a reproduction. Once you listen to DSD decoded with a discrete one-bit converter and gentle filtering, there’s no going back. The headphone output delivers all of this sound quality and more. Driving the stunningly great Audeze LCD-4 planar-magnetic phones through Nordost Heimdahl cable, the Nyquist was the best-sounding headphone amplifier I’ve heard (although I have not heard many top models). The clarity, transparency, detail, and transient response were phenomenal. Although I ran the Nyquist’s volume control toward the top end of its range on some music, it had plenty of drive on even the most demanding material. The Nyquist’s state-of-the-art headphone amplification section is icing on an already delicious cake. 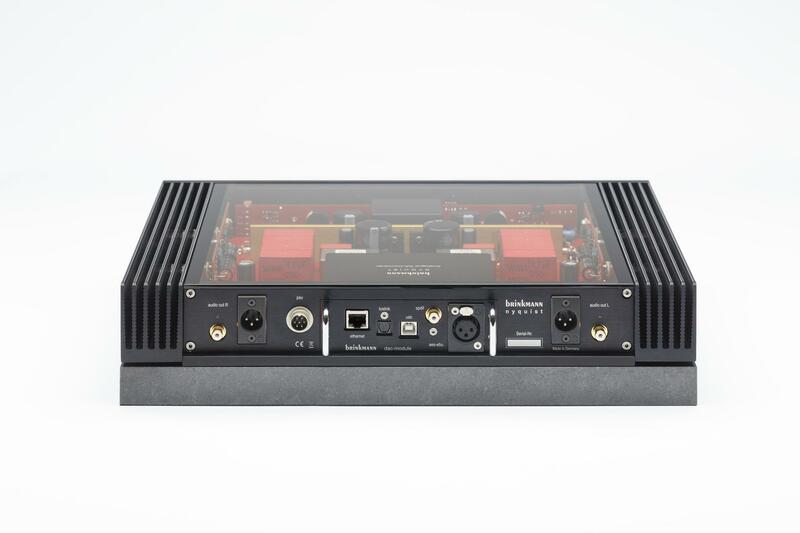 The Brinkmann Nyquist is the perfect marriage of the new and the old, combining the latest cutting-edge digital technology and connectivity with a tube-based analog platform. Moreover, the Nyquist embodies the ethos of one of high-end audio’s most passionate and dedicated designers, bringing 35 years of analog design experience to the digital arena. I also like that the Nyquist’s digital section can be upgraded, assuring that you can keep up with technological advancements. The world-class headphone amplifier further adds to the appeal. But best of all, the Nyquist is extremely compelling musically with its delicious analog-like warmth, bloom, and ease. When you add it all up, the Nyquist could very well be the off-ramp from the digital-upgrade highway. Dimensions: 16.5" x 3.75" x 12.2"